Geno & Shea ponder the path to defeat. The Uconn women saw a few things from Stanford tonight that they had not seen in years. A sold out house of raucous opposing fans. A team that UConn could not wear down with speed, athleticism, size and depth. A team that out-rebounded them. 43 to 36 on this night. A team that hip checked them, jumped in front of them, and pressed ball handlers without let up. A team that scored FOUR uncontested buckets on breakaways. Opposing post players that followed their misses with twisting under-the-hoop put backs that would be the envy of any team’s front court. A senior guard on the opposing team that personified toughness, clutch shooting and leadership equal to if not greater than any UConn Player on the court. Senior Stanford guard, Jeanette Pohlen, that is. And the UConn Women saw a few unfamiliar things in themselves, too. Maya Moore, taken out of her game, standing with hands on hips watching play rather than hustling to stay with her man. Maya Moore playing most of the game and scoring 14 instead of notching 20 points in 28 minutes as in a typical romp. Maya Moore, yielding first scoring option status in the final minutes to Kelly Faris, whose heart was as big as the State of Connecticut. Faris scored a career high 19 points. A game in which UConn was down 10 points (or more) for 10 minutes or more. One entire game in which UConn did not hold the lead once. Stanford was focused, ballsy, physical and equal to the task. There is a large gap between #1 and #20 in the Womens poll. I get a boot out of it when UConn Women Fans get a taste of Husky vulnerability. It doesn’t happen often enough. A regular season loss is the best protection against a loss in March. Geno should keep 5 or more Top-10 opponents on the schedule every year. Credit Geno for scheduling 5 Top-10 non-conference opponents this year. Credit Stanford with a ton of poise and talent. Tara Vanderveer’s team has all the tools and intangibles needed to capture a national title this year. One can only hope for a March rematch. 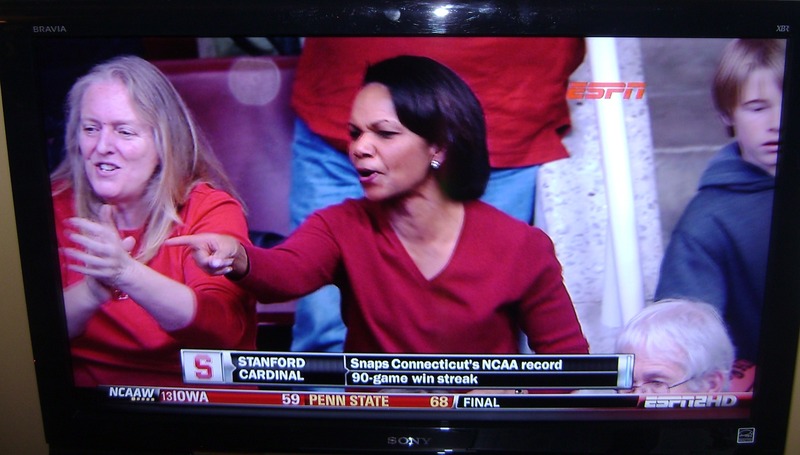 Stanford Prof Condy Rice & pal whoop it up. This entry was posted on December 31, 2010 at 5:44 am	and is filed under UCONN. You can follow any responses to this entry through the RSS 2.0 feed. You can leave a response, or trackback from your own site.